It was announced last Friday that Jennifer Aniston and Tig Notaro will play the first female president of the United States and her wife, respectively, in a political comedy called First Ladies for Netflix. Tig is also writing the script. This is Jen’s second project with Netflix – and it sounds a lot more promising because the other one is a movie with Adam Sandler. She also, as you know, along with Reese Witherspoon, has a two season deal already in place with Apple for a series about morning TV show hosts. I like these partnerships. She and Reese are co-producing their project and she’s a producer on First Ladies too, which means she’s investing in female talent behind and in front of the camera. First Ladies, to me, sounds like a great idea. I can’t wait to see how she and Tig play off of each other and, having read E Alex Jung’s piece last week in Vulture about gay storylines, which I linked to in What Else, I’m interested to see how this project plays out through that lens. Note too that that’ll be two features with Jennifer Aniston so far at Netflix. And we’ve just come off the anti-Netflix message at the Cannes Film Festival. How much longer can Netflix be denied though now that one big name after another is taking their work there? Now these are the kinds of Jennifer Aniston headlines I’m into. It wasn’t looking that way when she and Justin Theroux first announced that they broke up. Instead it was all about how her LA life was too boring for his New York energy, thanks to his bullsh-t leaks. We’ve already had to endure too many years of that narrative following her split from Brad Pitt. And she didn’t exactly discourage it. This time what we’ve seen from Jen, thanks to her friends’ social media accounts, is that she’s good, she’s having fun, and she’s picking up momentum on the work side. 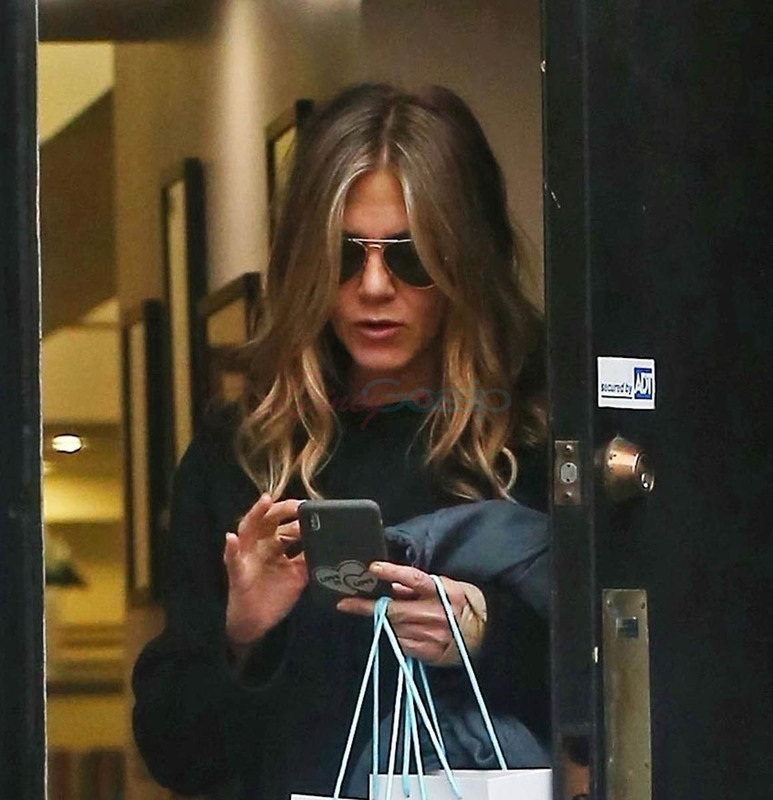 Here’s Jen yesterday leaving a hair salon. The paps said she was in there for three hours so I’m guessing she was maintaining her highlights? Three hours is, to me, a long f-cking time to spend in a salon. Which is why I’m happy I don’t have any highlights to maintain. You have to do it like every six weeks!